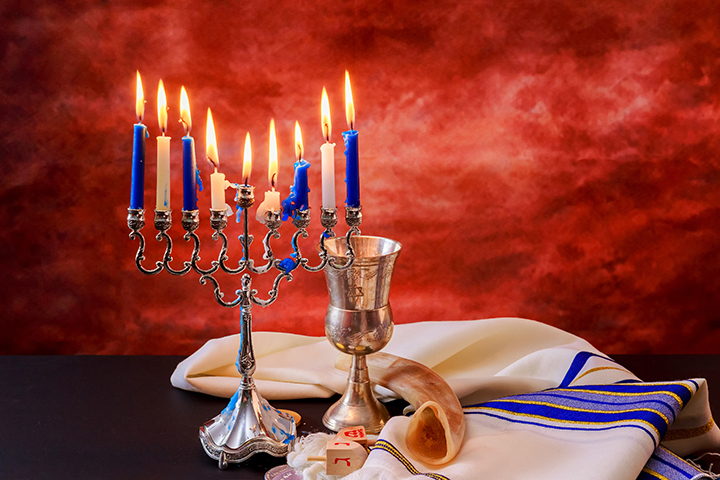 The eight-day Hanukkah celebration brings together the Jewish community with events throughout the Southeast. In community centers, houses of worship and public squares throughout the Southeast, Hanukkah celebrations this year take place in early December. The eight-day Festival of Lights begins this year at sundown on Dec. 2 and continues until nightfall on Dec. 10. The holiday commemorates the rededication of the Holy Temple in Jerusalem; when the Temple’s menorah was lit, the flame burned for eight days despite having only a one-day supply of oil. Traditional celebrations involve lighting menorahs, eating food fried in oil, playing with dreidels and coming together to rejoice in religious freedom. On Sunday, Dec. 2, the fifth annual Handmade Hanukkah Market takes place at Raleigh’s Temple Beth Or. Approximately 30 Jewish artisans sell handmade products. Items for sale include watercolor paintings, wood-turned pieces, jewelry, pottery, homemade soaps and baked goods. In uptown Charlotte, everyone is invited to a special Hanukkah, Hoops & Hornets event at the Charlotte Hornets NBA game on Dec. 12, 2018 at the Spectrum Center. During the game, special shout-outs from players recognize the holiday, and afterward, festivities continue with unique fan experiences and Hornets gifts for everyone in attendance. In front of the State House in Columbia, a giant Christmas tree and a giant menorah both stand tall. The symbols are a testament to our country’s freedom to express different religious beliefs. The menorah will be illuminated at the Isadore E. Lourie Memorial Menorah Lighting, which honors the late state senator, who championed the public celebration of Jewish life. (At press time, the date for the menorah lighting has not been determined.) In Charleston, Chanukah in the Square, which takes place Sunday, Dec. 9, has become the largest annual Jewish event in the state. The first portion of the event includes bands, children’s activities, hamburgers, cotton candy, latkes and chicken soup. To conclude the evening, Holocaust survivors light the menorah. The Jewish Community Center of Northern Virginia uses the Hanukkah holiday as a way to go beyond the center’s walls and engage with the public. On Wednesday, Dec. 5, the organization hosts the Community Menorah Lighting at Mosaic, a shopping and entertainment center in Fairfax. Representatives from a variety of synogogues and organizations light the candles of the large outdoor menorah. The event includes free live entertainment, and dreidels and sufganiyot (doughnuts) will be given to those who attend. At the Moses Myers House in Norfolk — once home to the city’s first permanent Jewish-American residents in the late 1700s — Hanukkah decorations include an antique menorah and dreidels. The house’s “History Speaks” lectures in December focus on faith and family. “Bernie’s famous latkes,” or potato pancakes, star at the Sunday, Dec. 9 Hanukkah Festival at the Gordon Jewish Community Center in Nashville. The latkes are just one part of the big family meal, along with live entertainment, photo booths and children’s games. In Knoxville, children are the focus for Menorah Madness — held this year on Sunday, Dec. 9 — a community event that seeks to help children connect with the Hanukkah holiday and their Jewish faith amid the commotion of the holiday season. The big surprise each year: What material will construct the menorah? Past iterations include LEGOs, balloons and an ice sculpture. Almost as soon as this year’s Hanukkah Bazaar concludes on Sunday, Dec. 2, the Sisterhood at Or VeShalom in Brookhaven, near Atlanta, will start preparing for next year. It takes months to bake the burekas (savory hand pies), sweets and other pastries. The foods and traditions found at a Sephardic synagogue, like Or VeShalom, tie back to Spain and the Mediterranean. In addition to food, the bazaar features vendors selling jewelry, artwork, cookware, clothing and more. On the coast, the Savannah Jewish Educational Alliance introduces its first Oy Vey 5K and Post Dash Hanukkah Bash on Sunday, Dec. 9. The post-race celebration is for everyone, not just runners, and includes a menorah lighting and prayers by local rabbis. We’d love to see how your family celebrates the holidays! Share your photos with us on Instagram (@AAAGoMagazine) using #GoWithGo and #HolidaysWithAAA!